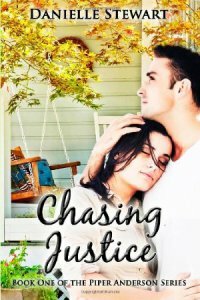 Chasing Justice is book one in my Piper Anderson Series. It follows the evolution of a woman who feels unworthy of love and introduces a colorful and endearing cast of characters who are hellbent on proving her wrong. Due to be released in May 2013 with additional books to follow closely behind. I love hearing from my readers and always answers all of my email personally. Join my mailing list for updates on contests and new book releases! Sounds like an intriguing premise.